Born in Nantes, France, Nicolas Longuespé comes to us with a background in advertising and public relations, which he pursued while living in Reunion Island in the Indian Ocean (a location that provided him with ample opportunities for surfing when he wasn’t busy at the office). After leaving advertising behind, he spent five years in Buenos Aires as a web content editor, French language instructor, and avid Tango dancer. More recently, he worked as a University Professor in his home city of Nantes. 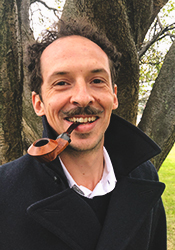 A passionate pipe smoker who counts Virginias and Orientals as his favorite tobaccos, Nicolas is now responsible for French translation and French language customer service for Smokingpipes Europe. A man of varied interests, he’s abandoned more hobbies than most of us will ever pursue. His current hobbies include cultivating discerning tastes for fountain pens, straight razors, and mechanical watches (among other objects); maintaining his exquisite mustache; and dancing the Tango. We're awed by the sheer elegance of his pipe smoking technique and style, as well as his ability to smoke a pipe while performing literally any activity without a single relight. We haven’t actually seen him dance the Tango while smoking a pipe, but we’re pretty sure it’s how he spends his weekends. Here at the office, you’ll find Nicolas hard at work in pursuit of his passion for pipe smoking, whether it's assisting customers in selecting the next piece for their collection or writing about pipes for the website.